^ a b c d e f Ruggles, Robin (1999). Apparition shrines. Places of pilgrimage and prayer. Boston: Pauline Books & Media. p. 68. ISBN 0-81984799-2. ISBN 978-081984799-7. ^ a b c d "Saint Bernadette Soubirous", Lives of Saints, John J. Crawley & Co., Inc.
^ a b c "Biography of Bernadette Soubirous". Biography Online. ^ "Miraculous cures in Lourdes". ^ von Huben, Ellyn (11 February 2015). "10 Things to Know About Our Lady of Lourdes and St Bernadette". Word on Fire. Retrieved 8 December 2018. ^ a b c "Religious life". ^ a b McEachern, Patricia (2005). A Holy Life": The Writings of St. Bernadette. San Francisco: Ignatius Press. ^ Fr. Paolo O. Pirlo, SHMI (1997). "Our Lady of Lourdes". My First Book of Saints. Sons of Holy Mary Immaculate – Quality Catholic Publications. pp. 49–50. ISBN 971-91595-4-5. ^ Henri Neuendorf (4 May 2015). "Battle over Remains of St. Bernadette of Lourdes – artnet News". artnet News. ^ Ruiz, Christophe (8 October 2008). "Cinéma: Un festival "Lourdes au cinéma"". La Semaine des Pyrénées (in French). Retrieved 3 July 2013. ^ (in French) See occurrences on Google. ^ (in Italian) RAI 3 – Lourdes. La storia. ^ The Song of Bernadette on IMDb . ^ Christophe Ruiz. "Cinéma: Un festival "Lourdes au cinéma"". ^ Bernadette Soubirous on IMDb . ^ Aquella joven de blanco on IMDb . ^ "Forever Andrea Television". Archived from the original on 16 April 2013. Retrieved 27 August 2013. ^ VHS tape and DVD Release. ^ Broadcast Productions (7 January 2016). "Home". ^ Our Lady of Lourdes on IMDb . ^ DVD poster Archived 3 October 2015 at the Wayback Machine. ^ Grotta profunda, les humeurs du gouffre on IMDb . ^ Une femme nommée Marie on IMDb . ^ "Le Coup de Grâce" on YouTube. Taylor, Thérèse (2003). Bernadette of Lourdes. Burns and Oates. ISBN 0-86012-337-5. The Miracle Joint at Lourdes] From Essays by Woolsey Teller, Copyright 1945 by The Truth Seeker Company, Inc. Critique of the Lourdes story. 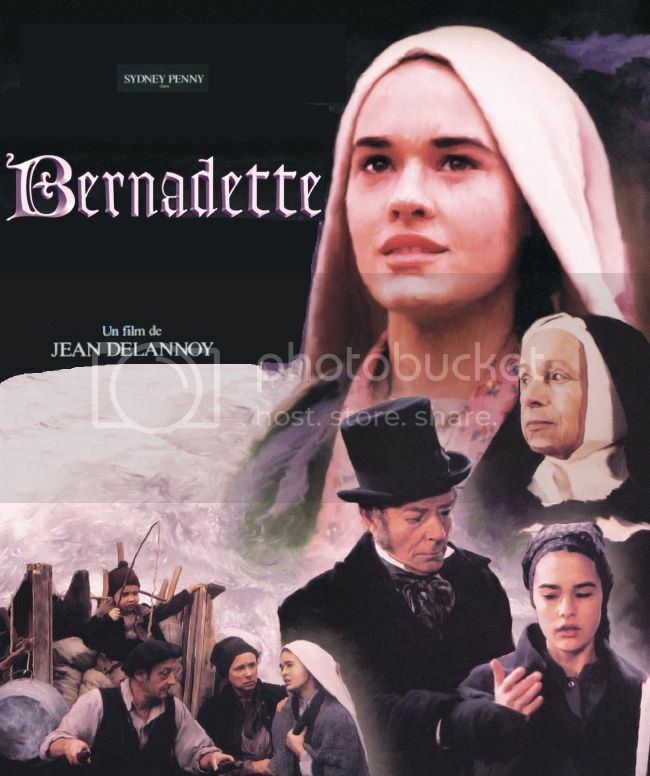 Bernadette Speaks: A Life of Saint Bernadette Soubirous in Her Own Words, René Laurentin, Pauline Books and Media, 2000. 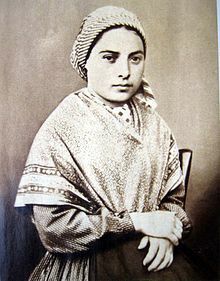 St. Bernadette Soubirous: 1844–1879, by Abbe Francois Trochu, TAN Books and Publishers, Inc., 1957. Wikimedia Commons has media related to Bernadette Soubirous. 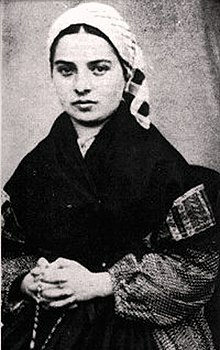 The Body of Saint Bernadette – Includes reports of her exhumation and photographs of her body and tomb. "Bernadette Soubirous". Find a Grave. Retrieved 11 August 2010.